Source: The clip to remove color changes from. Matte: The white of this clip specifies which Source areas to measure the flicker from. It can be inverted with the Invert Matte parameter. The requested average output color for the area within the Matte. Invert Matte: Check-box, Default: off, Shared . Measured Flicker R: Default: 0, Range: 0 or greater. When processing, this parameter is automatically adjusted to record the amount of flicker in the red color channel at each frame. You can copy the keyframes to a parameter in other effect in order to match the flicker in a different clip, or adjust the brightness on certain frames. Changing this parameter manually has no effect. Measured Flicker G: Default: 0, Range: 0 or greater. 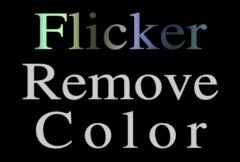 When processing, this parameter is automatically adjusted to record the amount of flicker in the green color channel at each frame. You can copy the keyframes to a parameter in other effect in order to match the flicker in a different clip, or adjust the brightness on certain frames. Changing this parameter manually has no effect. Measured Flicker B: Default: 0, Range: 0 or greater. When processing, this parameter is automatically adjusted to record the amount of flicker in the blue color channel at each frame. You can copy the keyframes to a parameter in other effect in order to match the flicker in a different clip, or adjust the brightness on certain frames. Changing this parameter manually has no effect.